Five foot diameter black walnut table. Nine foot long and four foot wide black walnut crotch wood dining table with steel inserts. Six foot long white oak crotch wood dining table. Twelve foot walnut conference table. Single slab construction, 2.5 inches thick with custom fabricated steel I-beam legs. Four foot long quarter sawed white oak floating desk. White Oak shelves ranging in sizes from three foot wide to four foot tall made to resemble molecules. Knock down yellow pine platform bed. Quarter sawed long leaf pine dining table. Lumber salvaged from a 175 year old barn located in same town as the table's new home. Cypress bench is flooring reclaimed from the same barn. Live edge, book matched, quarter sawn walnut dining table. 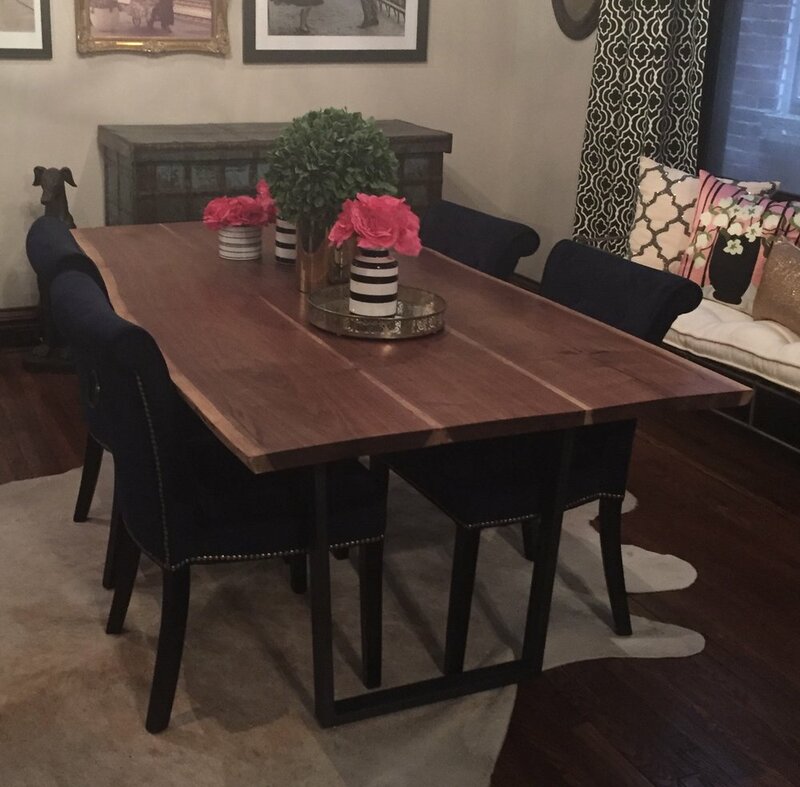 Eight foot long live edge black walnut dining table with matching bench. Six foot long live edge walnut dining table. Six foot long old growth white oak island top. Created to fit the space out of book matched quarter sawn red oak and a white enamel pine base. Created to customer specs out of reclaimed fir barn beams. Custom fabricated steel legs. Figured walnut coffee table created to fit a small space. Reclaimed long leaf pine coffee table top. Spice racks are made to order with your choice of wood and length and depth set to your specific space. Larger jars are available. Six foot long oxidized white oak table.